I am able to boot a VM from "archiso.vdi". Do you know what is the proper offset? The disk is mounted, but its filesystem is not recognised and Windows wants to format it. - the first partition (FAT16) starts at sector 172 and is 40 MB large. - the rest of the space is appears unallocated. If in AOMEI I assign a letter to the first partition, I can use it in Explorer. Image size used: 778043392 bytes. Total size: 778043392 bytes. Using 778043392 bytes from offset 0. To me, this means that devio is assuming a single partition as large as the whole 732 MB disk, which is wrong. It seems to me (without having seen the actual .iso involved) that there is anyway a base issue. Very likely the .iso is a "hybrid" .iso. i.e. a .iso that has been modified to behave - besides as an image of a CD or DVD - also as a hard disk image. Typically (not necessarily in this case) this is obtained by adding a MBR and a small partition before the actual iso, which is re-addressed as a partition in the added MBR, this is normally (almost, with some caveats) OK in Linux, but not on Windows. Such an image is simply not suitable to be used under Windows without modifications and/or some specific aded mounting steps and anyway, if there is a .iso partition, it will likely be a CDFS filesystem and as such "read only". While writing this post, I am downloading the latest archlinux-2017.02.01-dual.iso, I'll have a look at it and then report what I can find about it. The added MBR is a "mixed mode" MBR/EFI with the EFI protective partition (ID EF) NOT spanning the whole disk size and with a partition with ID 00 (which Linux accepts but that is a no-no in windows) covering the whole extents. More or less if you analyze the image (before converting it to .vdi) with 10 tools, you will see 10 different things as each tool will favour the one or the other or yet another possible interpretation of the data. 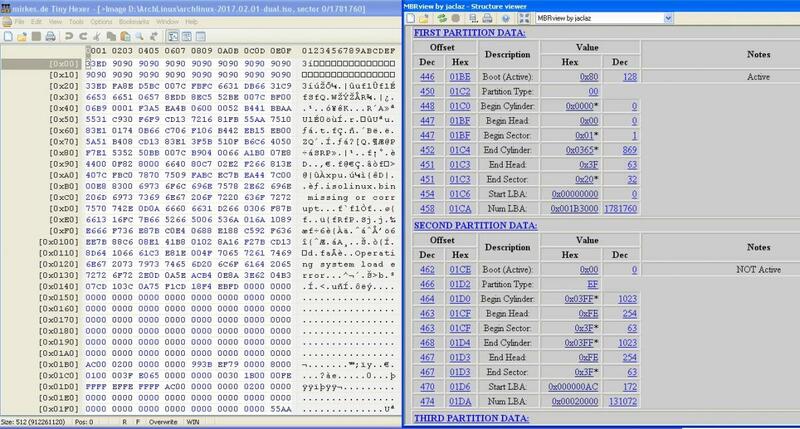 I am attaching a view of the MBR, as seen in a "normal" hex editor with MBR data parser. In that VDI image, the actual disk starts at offset 2097152. Total size: 778043392 bytes. Using 778011136 bytes from offset 32256. You could either force devio (on the command line) to use a specific offset or force ImDisk (still on the command line) to use that same specific offset. Wonko may be able to give you that offset (I am not able to retrieve that information looking at the screenshot provided by Wonko). Wild guess, to me the offset should be 172 sectors or 172*512=88064 bytes ? ("start LBA" in Wonko screenshot, "sectors before" in my screenshot). And the partition is actually 131072 sectors i.e 65536 KB. ("num lba" in Wonko screenshot, "sectors" in my screenshot). Another solution could consist in telling devio which partition to use (it uses partition 1 by default). That might be an easier/clean solution as you dont have to bother then with the offset (which may vary from one image to the other). Yep, there is a "valid" FAT partition at offset 172 sectors (if mounted with 512 bytes/sector), 64 Mb in size, but it is not like this would be of any particular use. It contains - among other things - a file "archlinux.img" containing a heavily compressed "archlinux" file shrinked from 155 Mb to 38 Mb which is an actual filesystem with a minimal Linux System. As often happens it is a sort of "matrioshka", I accessed it by mounting the .iso with 172 sectors offset in Imdisk, then opening the archlinux.img in 7-zip and then opening (still with 7-zip) the archlinux file. The MBR/GPT part, as said before, is a "mess", I am attaching (just for the fun of it) how gdisk sees it and a quick dir of both the FAT volume (when mounted in Imdisk as hard disk volume with 172 sectors offset) and of the CDFS volume when mounted in IMDISK as CD/DVD (whole file). And I suggest also having a look at it in Isobuster, which can highlight some more trickery. Would it work to specify a partition number explicitly at devio command line? 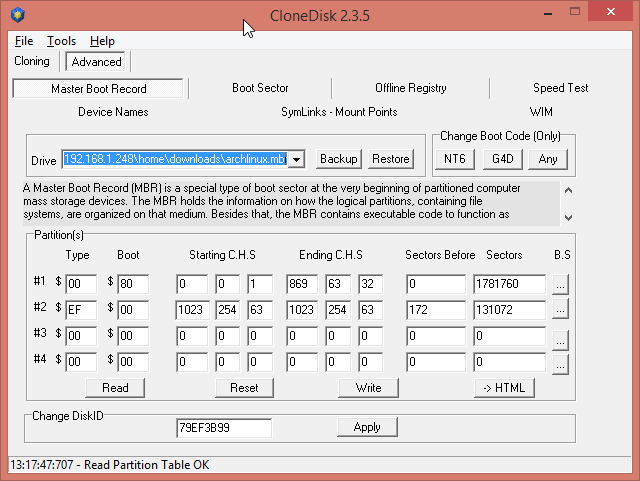 Even though devio defauls to first partition found in the partition table, you could specify other partitions as well. I believe that would be the cleanest setup (rather that passing the offset parameter to imdisk). Nice : had not thought about telling ImDisk to mount the whole image as CD/DVD. As a whole, I did not try to understand what the author of this thread is trying to achieve (turn an iso into a vdi and mount it?). I was focusing on how to mount this VDI image (and incidently ensuring my proxy was not faulty ). If devio doesn't check the partition ID in the MBR, then it may work , if it does, the EF partition ID will stop it in its tracks. I tried (on XP) to mount the "whole" .iso (not the converted .vdi) via the Microsoft VSS driver and of course Disk Manager saw the 64 Mb partition but wouldn't allow assigning a drive letter to it. But, just like erwan.l just posted, I am not sure about what the OP wants to do (or more generally can be done) with it once mounted. It should work, devio does not check any partition id values. It simply uses the partition number you specify, or partition 1 if you do not specify any partition number. To manually specify to use the entire image without parsing partition table at all, specify 0 as partition number at the devio command line (this is usually not used together with ImDisk but is required when using devio together with Arsenal Image Mounter or similar which require full disk images).